AC Coffee Mug in the Dunkin' Donuts article. 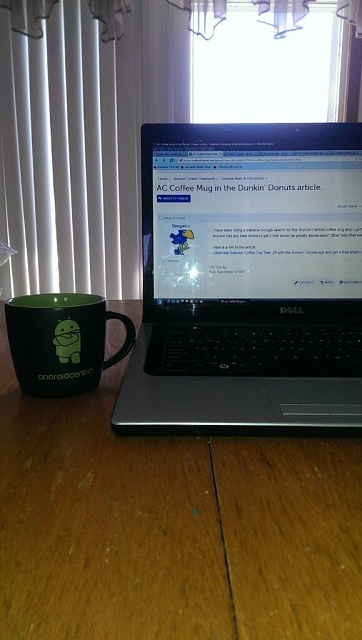 I have been doing a massive Google search for this Android Central coffee mug and I can't find it. I need this mug. I must have it. If anyone has any idea where to get it that would be greatly appreciated! Other than that keep up the great work AC! It has been stated on G+ that the mug won't be made available for purchase. Sorry. It really is a nice mug, though! Patrick Schroedl, srkmagnus and Deegan like this. It's a great looking coffee mug! Coffee taste better with it as well . Though, that's not scientifically proven, just my personal opinion. Paul627g and Golfdriver97 like this. Way to rub it in Paul! Oh well, I guess my poor generic not cool coffee mugs will suffice... Thanks for the info! Paul627g, Patrick Schroedl and Deegan like this. what is the best way to mirror/sync two Note 8 tablets? Can somone recamend a great all in one email client that works with active sync and gmail?